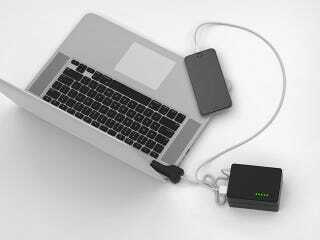 BatteryBox is the one of the most powerful portable battery packs available - it can power your Macbook for 13 hours and charge your iPhone up to 11 times without the need for an outlet. It's the highest energy-density product of its kind, and Deadspin readers can get it for 42% off with code DS-BATBOX. BatteryBox uses its own "BatteryOS" technology that monitors lithium-ion battery power and optimizes performance for minimal degradation. As a result, BatteryBox maintains its original capacity for up to 5 years - 3x longer than any device of its kind. It's also better for your batteries than standard chargers, and will help your device's battery last 4 times longer. It's small and portable, so you never have to worry about finding an outlet when you're on-the-go. Get yours at the link below, and save 42% with code DS-BATBOX. Shipping is free to the Continental US; use the dropdown on the product page to check out the international options. Hit the link below for more info and grab yours today.